AgroAtlas - Pests - Psila rosae (Fabricius) - Carrot Rust Fly. Psila rosae (Fabricius) - Carrot Rust Fly. Class Insecta, order Diptera, family Psilidae, genus Chamaepsila. There may be a complex of sibling species in the Far East. Chamaepsila rosae (Fabricius), Chamaepsila hennigi Thompson & Pont. Body is 4-5 mm long, brilliant-black with greenish tint; head rounded, rusty-yellow. The vertex has a black spot around ocelli. Antennae located under slightly projected frons. Third segment of antenna is dark, with bright yellow arista. Wings are wide, brilliant, with greenish shine. Legs yellow, with lengthened basitarsi. Abdomen is oval, small and much shorter than wings. Female lays eggs in the evening, placing them on damp ground at a distance of 0.5 cm from carrot root or under root neck on root of celery plants. Average fertility is 100-120 eggs. Eggs are milky-white, oval. At the peak of flight the females can lay 10 or more eggs on 1 plant. Embryo development lasts 4 to 17 days. Larvae are cigar-shaped, pale yellow, brilliant. Development of larvae lasts 20-25 days; they pupate in ground at a depth of 4 to 10 cm. Flies of the second generation appear in July-August, their larvae develop over 40-50 days. Some of the Larvae get into storehouses together with roots, where they finish feeding in autumn or in spring. Pupation occurs in ground at a depth of no more than 10 cm and pupae remain wintering. Western Europe, Northern America and New Zealand. In the former USSR it is found in the European part (from the Caucasus to forest-tundra), in the south of Siberia and in the Far East; the species probably inhabits more northern areas of Asian Russia, but such data is still unknown. In the Ukraine it causes more harm in areas with higher humidity (western forest-steppes, Polesye, foothills of the Carpathian mountains). Develops in 1 or 2 generations; trivoltine in Georgia. Imagoes of spring generation appear in southern and middle areas in May during flowering of apple and rowan, flying in June in the north. 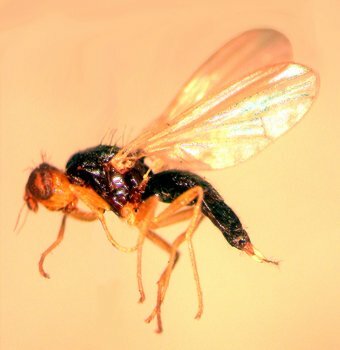 Flies of the second generation appear at the end of July and the beginning of August. This is a hygrophilous and shade-requiring insect. It concentrates in shady areas, near forests or reservoirs, and also on thickened or strongly weedy fields of carrots, where the high air humidity is constantly kept at the ground level. Moderately damp weather and temperatures of 15.5-17.5°C are optimum for the start of flight. The larvae damage the pulp of carrot roots, roots of parsnip and also parsley and celery; and sometimes are found on roots of hemlock, dill, and caraway. Hatched larvae gnaw through the roots of young plants; penetrating later into the roots, making holes of rusty color. Damaged plants have bluish leaves, which turn yellow and dry up later, and the roots rot. Control measures include maintenance of crop rotation; sowing in optimum-early time, removal of damaged plants; mixed crops; deep autumn plowing of fields after harvesting in order to kill pupae of the fly. If agronomical rules are not observed the harmfulness of the pest becomes high, and chemical treatments are required on shoots.